With a flash of black and red wings the red admiral adds a splash of welcome colour to our gardens and woodland from late-spring to mid-autumn. This striking butterfly is a migratory species that makes its way up from the Mediterranean, moving north as the weather warms. Resident populations in North Africa and southern Europe breed early in the year. Then, as the weather warms, the adults and their offspring start to move north, breeding as they travel. The adults typically start arriving in Ireland about mid May, although a few eager specimens get here earlier. This influx of adult butterflies from mainland Europe, combined with those produced here over the summer, can sometimes result in very large populations of Red Admirals come autumn. 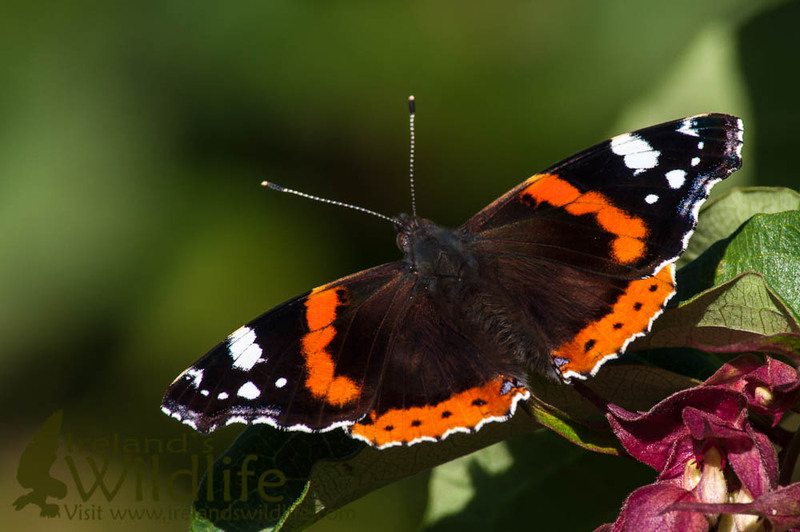 The Red admiral is one of our largest butterflies, with a wingspan of around 60mm (2.36 inches). It is unmistakable, with mostly black wings showing a striking red band and white markings near the tip of the upper wing and a red border on the lower wing. As you would expect from a migratory species flight is powerful and active with intermittent glides to conserve energy. The Red Admiral can be found in a wide range of habitats from sea level up to an altitude of about 2000 metres (6561.7 feet). Although it is mainly active during the day individuals of this species have also been known to fly at night. Females lay small, pale green eggs about 0.8mm (0.03 inch) long individually on the upper leaves of the stinging nettle (Urtica dioica), usually in the middle of a dense patch of plants. These eggs darken as they mature and normally hatch about a week later providing the weather is favourable. Here in Ireland the earliest caterpillars emerge in June, but they are most common during August and September. Once out of the egg the young caterpillar pulls the nettle leaf around itself and binds it with silken thread to form a protective ‘tent’ where it can feed in relative safety. As it grows the caterpillar moves from leaf to leaf, making progressively larger tents as it goes to accommodate its increasing bulk. There are two caterpillar colour forms: the dark form is almost black, and the light form is a greenish-grey. Each body segment exhibits branched spines the same colour as the body, and both colour forms have pale yellow markings down each side. When fully-grown red admiral caterpillars reach a maximum length of around 36mm (1.41 inches). Once it reaches this stage the caterpillar will bind several nettle leaves together to create a chamber in which it can pupate. The adult butterfly will emerge from the chrysalis around fifteen days later and the cycle will begin all over again. The adults feed mainly on flower nectar, but also on decomposing fruit and the sap from injured trees. Although many red admirals try to hibernate here they tend to choose quite exposed sites and rarely survive the Irish winter. However, come spring a new batch of these beautiful butterflies will be winging its way towards our shores from the continent, and our all too brief summer will be all the brighter for their arrival. Hi, its 11/01/17 and just found a red admiral in my house. I live in co.Kerry Ireland. Just wanted to know if this was common? ?